The Reality of Vibrant Christian Living! Vibrant Christian Living and Optimal Health - physically, emotionally, and spiritually - is your Spiritual birthright and should be a reality for you, not just a pipedream. As Christians, we ought to be living lives full of joy and contentment - lives full of power and fulfillment - lives of victory and success - lives that testifies of the power of God to deliver from the mundane life of toil and defeat -- in short, we ought to be living lives that exist on a much higher plane than that of the rest of the world. If this is true, then why are so many Christians struggling to find real meaning for their lives? Why do we find ourselves struggling with sins and addictions that seem to overcome us at very turn? Why are our marriages floundering? Why are our children abandoning our families, our churches, and our God? Why are we sick so often? Why can't we seem to find true acceptance, peace, love, joy, or contentment? If the Christian life is really supposed to set us "Free", then why do we find ourselves so guilt-ridden and bound by the cares of everyday life? Now Available to Study Online! This is BY FAR the most comprehensive study on the Holy Spirit you will find in one place anywhere. This study is the result of several years of intense personal study and has previously been available only in Book form. Now you can have access to the entire study FREE right here. 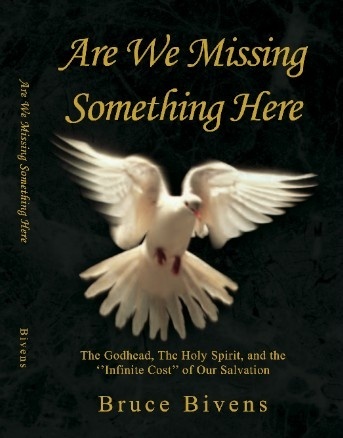 If you have ever wondered WHO the Holy Spirit is, WHERE He came from, HOW He came to be offered to us and at what cost, or WHAT a difference the answers to these questions can make in your own Spiritual Life -- then you owe it to yourself to read this eyeopening study. There are Twelve (12) studies in all, carefully backed up with hundreds of Bible and Spirit of Prophecy quotes and presented in a refreshingly Clear manner. Where additional notes are included you will see a small superscript box (like a footnote reference) that looks like this 1. Simply point to the red superscript box to read the Note - and Close it when you're finished. I strongly encourage you to look up all the references, especially the Scriptural ones, so that you can see how much the Bible actually has to say about this wonderful Gift. To START the studies just CLICK on the picture at the top right of this box. Enjoy! P.S. If your interested in obtaining a hard-copy of this study (and you will probably want to once you see how good it is) then simply Click Here to be taken directly to the Publisher's Sales Page. My aim in starting this site was to bypass all the "Pat Answers" that are frequently tossed about which often leave one feeling more confused and more frustrated than you were before you heard them, and to try to get down to the "nuts-and-bolts" of what Christianity is really meant to be. I am not interested in "Playing Church" any more -- Are you? Either the Bible and Christianity have something Very Real to offer us, or they don't -- and the sooner we find out which it is the better! I have tried to offer a fairly wide variety of subjects here -- subjects that deal with the "Whole Person"; physically, mentally, emotionally and Spiritually -- as we must be healthy in ALL these areas if we are to really experience all that God intended for us to be. When we lack in any of these areas the other areas are affected also (positively or negatively), so I am doing my best to provide you with the most current and best information and resources possible for all of these areas. However, this site is still evolving and as time has gone on I have found myself most interested in the "Spiritual" side of the equation and have found myself devoting the majority of my efforts to providing the most comprehensive (and Practical) Bible Studies on the subjects that impact us the most. These studies may not always agree with what you have been taught (or led to believe) but I have done my Best to insure that they are Biblically Sound, Accurate, Straightforward, and TRUTH-FILLED. I am currently seeking the help of "Others" who can provide the BEST in the other areas (Diet, Health, etc.) and will be posting new materials on these subjects as they become available. If YOU are qualified and are interested in sharing your knowledge here, please Contact Me and we will discuss the possibilities. The BOTTOM LINE is that Jesus Christ is coming back soon! Are you ready to meet Him? Are you doing all you can to help others get ready to meet Him? Do you have the tools and the knowledge you need to stand strong and victorious and triumphant in the difficult times ahead. Do you KNOW THE TRUTH? And has the Truth SET YOU FREE? My sole aim is to help you become prepared and successful in your personal relationship with Jesus Christ and in your Christian Walk. Regardless of where you have come from or where you find yourself right now, there is no reason why you cannot enjoy Optimum Health and a Vibrant Christian Life. There is absolutely no reason why you can't be Enjoying the Spirit-filled Life, or why you can't begin enjoying it right now! Please take a moment right now to Bookmark this Site so that you can return to it often. If you appreciate the information you find here -- please, share it with others! Tell them about this site and invite them to visit here too! Below is a table of contents for this site with a brief description of what you will find under these heading. Additional pages, topics and information is often found as sub-topics within the topics listed here -- so be sure to check them all out! The most COMPLETE study on the Holy spirit on the Web. You will find out exactly "WHO" the Holy Spirit is and the Tremendous Sacrifice it took to give Him to us. You will not want to miss this study! "Love Is" is my version of 1 Corinthians 13. It puts feet on what Love actually is and is quite thought provoking. See how YOUR Love measures up! Our "Church face" doesn't help anyone. If we are going to reach people, and help them, then we are going to have to get "Real". Learn more. How to be free from guilt and be truly forgiven. What is Repentance? Surprisingly it is not simply being sorry. Find out what it is and how you do it here. This page gives a more in-depth understanding of what is involved in God's forgiveness of you -- and in your forgiveness of yourself and others. Find out "why" Jesus had to die in order to provide you with forgiveness and a new life. There is much more involved in Chirst's "Death" than we have Traditionally understood! This page discusses how to have peace of mind, contentment, confidence and security. It discusses the Spiritual side of our natures and how to improve it. Many of us have an intellectual understanding about God but have failed to into the vibrant EXPERIENCE of God. This page explains the dilema we face and how we may enter into the experience of God. This page discusses some of the "Hottest" topics in the Church Today. Don't miss these! Adventist Issues at this time -- includes issues that we are currently struggling with and many that we are flat-out wrong about. This is a listing of some rather provacative "New Light" Quotes. It is Clear from this list that God intends to send much more "Light" to us -- even After Ellen White was Gone. Books, Cd's and other cool stuff; Recommended by Enjoying the Spirit-Filled Life. Here is where you can contact me and send me your comments, questions and requests. If you have any interest at all in just WHO or what the Holy Spirit is and how He came to be offered to us -- this book is for you! Interested in building your own website? Check this out! I have just completely Re-Styled this Homepage and am in the process of converting the whole site to this format. It is my hope that this format will be easier to navigate, more asthetically pleasing, and contain more information and products than my old style could. Since not all of the pages on this site have been converted yet, you will still find some pages in the old style as you navigate through this site. I am working hard to get them all converted as quickly as possible. If you like the new style, I would appreciate your feedback. If not, then I would like to hear from you also. I am including something VERY NEW for this site -- it is the on-page pop-up "Note" box that can be found on some pages. YOU WILL NEED TO ENABLE SCRIPTS ON YOUR BROWSER FOR THIS WEBSITE TO VIEW THESE (an "Alert" may appear at the top of your browser page - you do not need to worry as there are no malicious or harmful activities being run - simply click "Allow"). An example of this Note Box marker appears here 1 be sure to point your mouse at it and read the Note! If you have trouble viewing these in your browser (i.e. Firefox) or if they appear but are unreadable, you may want to try viewing it in another browser like IE (Inernet Explorer). I am still trying to work out all the bugs. Your patience is appreciated!